Vow: Although contrived, there may have been a vow of some type taken in the past. Maybe the vow went something like this, “Because I was so horrible to our goldfish, I will only buy white vehicles the rest of my driving career.” Of course, the vow is likely to have been far more convicting than this one. I erred on the side of humor rather than hitting any nerves. Color Blind: Why have lots of colored cars if you can’t distinguish them anyway? Just go with one that your defective eyes can reliable detect every day of the year and twice on Sundays!! Family joke: This one might have potential. I had friends once who had two identical cars. One was named “Spot” and one “Stripe”. I could never tell them apart, but the game worked for them. (They also have 4 boys. Back in the day when boys/mens white socks had stripes on them, the mom used this to her advantage. Each boy had socks with a different stripe. If the wrong color stripes showed up in the wrong drawer, it was a sorting error or out right theft.) A son might ask the question, “Which car can I take tonight?” The dad will just say, “Take the white one.” (In Texas, this is probably foolish. Most kids seem to think they deserve their own cars.) It might just be one of those corny jokes that prevents other color cars from being considered. Perceived Goodness: Some may want a white car just because it looks more innocent than a red car. The Lone Ranger rode a white horse. So, maybe dad’s Mustang convertible is just part of his lifelong quest to fine a good friend named “Tonto” out there on the range. ….most realistic: White cars don’t show dirt as quickly as a dark car. And, for those who don’t like to visit the care watch too frequently, a white car is an excellent addition to your families portfolio of vehicles. Since returning from my trip earlier in the week, Texas has been wet. When Texas or any place is wet for long due to constant rains (the “flash flood” type rains have a slightly different set of rules than the standard rain driving rules), there are a set of rules common sense drivers should follow. Hydroplaning: I have found the far right lane tends to be the lane where the water congregates. What is hydroplaning? It is water deep enough that when you try and drive through it it slows you down significantly. And, if the water is deep enough, it limits your ability to control the car. (The really bad side of this is usually found under bridges or when rivers/streams overflow.) While this may be an issue with limited impact to other drivers, if you hit the water just right and shoot up a bunch of water, it may cause other drivers to need their…..
Windshield Wipers: While it seems obvious these are necessary when it is wet out, the speed of the wipers can contribute greatly to your visibility. IF someone hits a big puddle at a high rate of speed and you just happen to be next to them when the “spray” flies onto your windshield, the wipers help you to get oriented and recover quickly from the blinding spray. Stopping Distance: IF you are blinded by a windshield flood and you don’t have a proper stopping distance, you will wish you had one. When I went thru drivers ed MANY years ago, they taught you should have a 3 second stopping distance. (Watch the car ahead of you pass a certain landmark, light pole or whatever. Count the seconds until you pass it. It should be over 3 seconds for good weather and more when wet.) While my competitive nature sometimes modifies this rule, it is still good to have a baseline. When cars are doing lots of weaving, I especially like to modify the rule to keep them from jumping into my lane. Headlights: Can you say “pet peeve”? As the rains poured down today, I didn’t see lots of cars without headlights, but they were still there. (When the rain is lighter, the ratio or headlight-less drivers seems to be higher.) As I look in the rear-view mirror, I am not blind–I see most everything. But, if the headlights are on, I see you more quickly. While lane jumping is not a great idea when it is wet out and the reaction time of other drivers might be slower, a quick glance that does not immediately reveal a car lurking on your tail may lead to a lane change with a conversation punctuated by horns. When in doubt, headlights are good. In conclusion, when driving on the road there is a “handshake” agreement made with all of the other drivers out there. While some days the handshake may be like a wet dish rag and other days it may be a firm “Vote for me” type handshake, the road is not your private domain. It is a shared resource for all taxpaying citizens (and non-paying) to enjoy. (Or, if you hate commutes, not enjoy. But, it is still there for you.) It is a necessary evil in places where mass transit it not readily available. So, if it not a big problem next time it rains, just keeps the lights on for me. As my wife and I ran a couple of errands last night, we noticed the bank drive thrus and other related areas with overhangs were filled with parked cars. It didn’t take too much thinking to realize this was how many drivers attempted to provide hail protection for their cars that would not fit into their garages. O, if they were working, they just chose to park strategically. Fortunately, no hail came along. Having heard multiple stories recently of cars being fixed after hail damage only to be hail damaged again, it is quite clear hail shows no favoritism. As I Skyped with a friend this morning, he jokingly suggested a product be created to defeat the affects of hail. 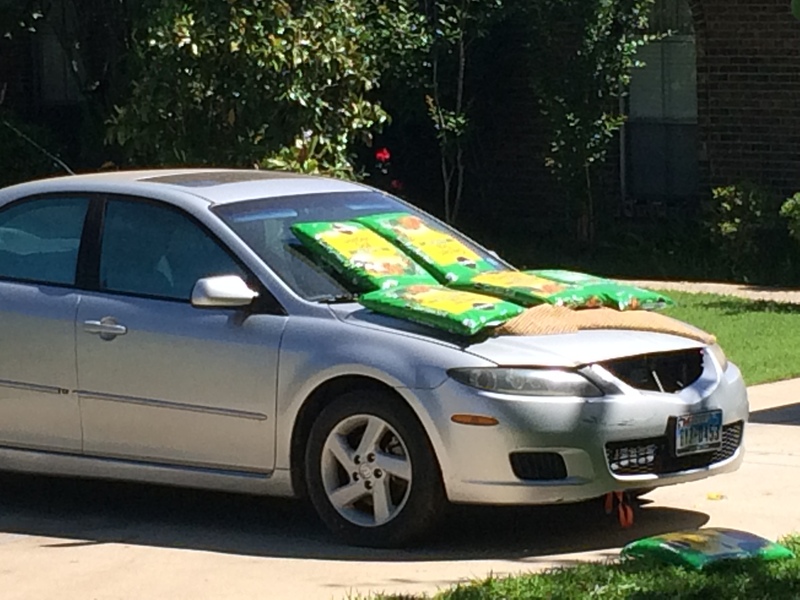 A quick Amazon search showed a hail protection product (out of stock) that performed this task admirably. After suffering the disappointment of having a low-cost product already existing to prevent hail calamities, ideas for volcano, hurricane and sink hole protection were also rejected. As I was in the last third of my walk today, I noticed how somebody used landscaping items to build their own hail protection system. Since we received no hail in our part of Texas, it could be said it worked perfectly. Somehow a moving blanket and bags of top soil (notice the one bag that slipped off the front) achieved the goal. Or, the minimum effort on the part of the homeowner gave them enough peace of mind to allow them to sleep well despite the thunder, wind and other possible weather perils the storm front potentially offered. And, if I knew 6 bags of top soil would guarantee me a great night sleep, I would make that purchase every time! A couple of days ago, I experienced what wildlife in suburbia looks like in Texas. This is not the stuff I find taking one of my frequent walks. This is the stuff found while driving the roads that constitute our “stomping grounds”. While armadillos and opossums are more often seen as roadkill then lumbering about their business, it is never uncommon to smell the scent of a skunk as we drive to school. On this day, a fox and turkey both literally crossed our paths. The fox siting was far from exciting. With headlights on and no more than a couple of miles from our house, a fox dashed across the road. (It was too skinny to be a wolf, and I have recently become an expert in recognizing bobcats.) I was going south, and he crossed from west to east. He was wearing a bonnet. I attributed this to him being someones pet rather than him infringing on the wolf and his Goldilocks aspirations. After a brief period of frustration battling the two mile stretch of the freeway, I start the final stretch of my weekday journey. To the east of the school, there is a large amount of industry. (I have seen a powder coater, a pool cleaning company, and a few distribution companies.) Within a 1/2 miles of the school, this large object launches itself off one of the buildings on the south side of the road. (The launching might be a slight exaggeration.) As he lands to the adoration of his entourage, he bows and waves. He gives oncoming drivers his easy smile as he crosses the road in front of us. As I begin the return leg of my journey, the tom turkey is on the north side of the road. He has his rear feathers spread while he continues to strut about. Having seen him and his concubines in this location before, I know he has probably been adopted by one of the businesses in the industrial park. Sometimes, God lets you see a bit of nature just because you need to realize the world will go on when your worries are gone. Whether it is a “fox on the run” or a turkey on the move, I enjoy the moments when my concerns are put into perspective. As I began the part of my day commonly referred to as “pick up the girls”, [taxi for teens]. I got a little bored thinking of the routine of it all. (If my actions should ever rise to the level of being on an assassins radar, a routine could get me killed. Fortunately, I am not very accomplished…) As my mental cruise control continued to run unimpeded, I made the right hand turn onto the access-road/entrance-ramp. I made sure I was in the far left lane so I would not have to think further as I followed the lane directly onto the freeway. While the highway was on the left, a big box store was on the right(actually quite a few such stores). The parking lots dumped directly onto the access road. It was the hope all drivers entering the access road would exercise common sense as they pulled onto it. Since there were many right-sided access points to the road sandwiched between the highway and the shopping area, I was fortunate (Really not fortunate) to encounter a truck. The truck was driven by a young guy who was determined to squeeze onto the entrance ramp between me and the driver ahead of me. Even though he would have to clear 3 lanes of traffic and immediately enter the highway, he saw it as an excellent opportunity to burn off some excessive testosterone….while forcing me to either find mine or deny its presence entirely. As he pulled into my lane and forced me to brake (I do admit to speeding up to try and keep him from executing his plan), an extended tap of my horn seemed in order. As he got up to speed and we entered the freeway, I thought briefly the whole affair had ran its course. This was not the case. The lane we were in was an exit only lane. I immediately switched lanes expecting him to do the same. When he didn’t switch lanes, I made an effort to pass him on my right. Not surprisingly, I was greeted by his bumper as he whips his truck into my lane and cuts me off. He briefly slowed which forced me to do the same. Once his appetite for revenge was quenched, he sped up and thought no more of me-at least in a tangible way I could see. Today, I had a different morning driving encounter. As I was driving the daughters to school, I noticed the traffic on the other side of the highway was not moving too fast. I resolved to take the access road that runs parallel to the main road when returning back to our home. It did throw a couple of extra traffic lights into my commute–traffic lights that seem to only let cars trickle through when a flood would most certainly benefit me. One light was a very light trickle this day. While patience is not one of my strengths, I like being trapped on a freeway with non-moving vehicles far less. As I was within a light or two of clearing the intersection, I continued to look to the right–a turn only lane. I kept looking for turn signals of people who wanted into my lane-driver’s who wanted to skip the line I waited in and jump ahead quite a few cars–like jumping in front of my car for instance. I had nearly convinced myself I was going to make it without any intruders even attempting an attack on my lane. I don’t consider myself an “aggressive” driver, but I will certainly defend my car’s right to its little safety cushion. So much for maintaining the safety cushion…. As a small gap opened ahead of me–not even big enough for a small vehicle–a truck stuck his nose in. Since he hadn’t given the obligatory pause to seek my permission and just plowed into the lane, I was not going to give in quietly. My horn was fully engaged until he was completely absorbed into my lane. (It must have been a couple of seconds.) As my pulse was heightened and I was still processing the special bonding I had just shared with this cowboy, he decides to honk his horn for an extended period to commemorate our chance encounter. Fortunately, no damage to my car or me. It just was a continuing reminder of why driving is not for the perfectionist. While others may drive and be oblivious to those sharing the road with them, they do often need to have other drivers help them out when they look up after sending that text or petting the non-distracting dog on their lap. I may not like having to be friendly with these other drivers, but every time I put the key in the ignition I am taking an oath to try and work with all of those who chose to stick their keys in the ignition, too. While I dislike the driving process, rarely do I need to read the asterisk related to my oath that mentions how some days my horn is a little more sensitive than others…. After dropping my daughters off at school, I was sitting at a traffic light waiting for it to change-something I do numerous times every day. (This traffic light was where an exit ramp and main road met–I was preparing to turn left.) While I was relaxing at the light listening to music, I received a slight jolt. A quick glance in the rear-view mirror revealed a truck had definitely got too far into my space. After calming down (it did not really upset me that much, but it was certainly off my normal routine. ), I made my way home. My wife was still there-not having yet left for work. She was disappointed I chose not to be more firm in seeking resolution at the point of the accident. I was glad she went to work shortly and came home nearly forgetting about it. I had practically already forgotten it myself….